WeWork's Creator Awards is looking for innovative musical performers (solo or groups) based in the Philly Area. You can apply to one of three categories including the Performing Arts award, for entertainers and groups with a unique perspective. 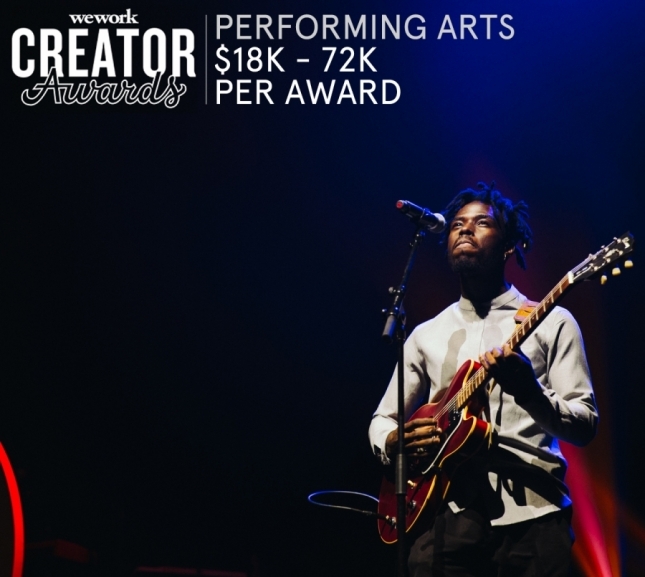 WeWork's Creator Awards is looking for innovative musical performers (solo or groups) based in the Chicago area. You can apply to one of three categories including the Performing Arts award, for entertainers and groups with a unique perspective. WeWork's Creator Awards is looking for innovative musical performers (solo or groups) based in the Nashville area. You can apply to one of three categories including the Performing Arts award, for entertainers and groups with a unique perspective. WeWork's Creator Awards is looking for innovative musical performers (solo or groups) based in the NYC Area. You can apply to one of three categories including the Performing Arts award, for entertainers and groups with a unique perspective.